Still touching up the early areas which have been long neglected. Also expanding some of it a bit more to help with levelling. Titan Quest is quite drawn out with content which works well with levelling progression but with Hamunaptra the difficulty scales up a lot quicker so hopefully adding a bit more meat to the beginning areas will help with this. As I'm doing this however - "...a new area? 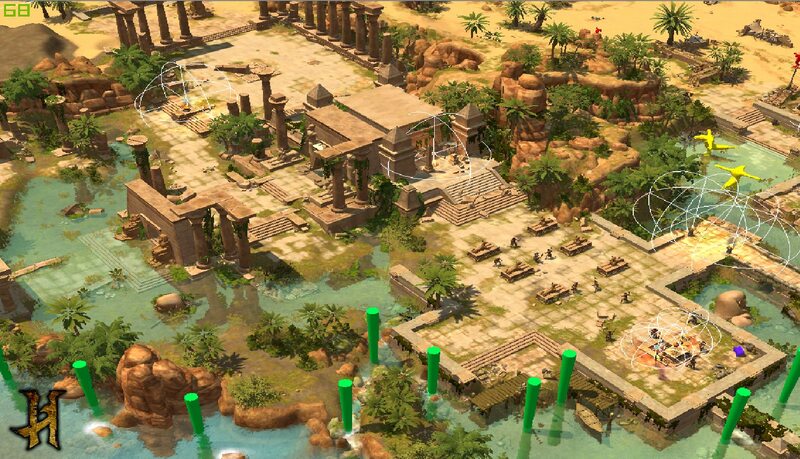 Probably need another ruined temple and accompanying dungeon"
New expanded early area is taking shape - some overgrown Nile temple ruins, perhaps a promising farming area for your fresh hero? We'll see..
All a WIP of course. The stairs and walkway under the water is bea-u-ti-ful! Fantastic job as always bro! Currently there's two dungeons to explore here; the main temple itself and a sunken tunnel complex thats not seen in that shot. There's some cultists around the area but am thinking of having the theme of the ruins associated with the god Sobek. A crocodile boss maybe?? The screenshots look amazing.My favorites whould be the one with overgrown ruins and the one with a dark tomb and a statue sitting on a throne.Once the mod is finished,you should also upload it to Steam Workshop.I dont think I need to tell you this,since I remember one day when I was scrolling through TQ Steam disscusions,I clicked mod disscusions and I have found a trailer to Hamunapatra.Thats pretty much how Ive found your mod. Btw,how will checkpoints work?Will it be something similar to Lilith,in wich you dont have rebirth fountains,only portals and restpoints(wich are kind of like fountains,if I think about it). Your skill with maps and lights is truly amazing. @mvlad954 Yeah those are some of my favourite shots as well, I love the darkness of the tombs and having some overgrown ruin locales is refreshing. I'll definitely be releasing on the Steam Workshop, I know many like yourself check over there frequently. I'm reluctant to put anything on there yet that's not playable though. Hmm regarding checkpoints I have played Lilith ages ago but don't remember these 'restpoints' but yeah, at the moment in Hamunaptra you will find Rebirth fountains. I'm sort of approaching this in a way where there a fewer of them and longer distances inbetween, with some actually being semi-hidden. For example in a large tomb with multiple levels you might run through it, reach the lowest level and die.. this can get frustrating having to run all the way back etc. So to help with this you might find a secret chamber say halfway down within the tomb and inside is a hidden Rebirth Fountain. Thought on this? Of course playtesting will tell me if this is fine but we know I guess from the Athens catacombs that is helps a lot huh. @nargil66 Wow huge compliment! Thank you sir! For example in a large tomb with multiple levels you might run through it, reach the lowest level and die.. this can get frustrating having to run all the way back etc. So to help with this you might find a secret chamber say halfway down within the tomb and inside is a hidden Rebirth Fountain. Yeah agreed. I like the Rebirth Fountain idea as a whole, I think it reduces the tedium of re-running areas already cleared and makes the playthrough more efficient. It seems they're still unique to TQ as well since Grim Dawn doesn't have them.. Agreed. I really hated that GD dropped the rebirth fountains, especially during early access. I know we didn't have that far to go in the game, but I was so slow I often didn't reach the next riftgate during a play session and had to run/clear the whole area again. Plus it was another reminder of D2 since it's the same in that game and I didn't like TQ's spiritual successor moving closer to D2 than it had to. I've gotten used to not having them in GD, but even now there's some areas I won't start playing because I know I won't have time to clear it all before I have to finish a session. Making them a bit more difficult to find would add interest and encourage exploration.